Is your child refusing to give up a dummy? Adamant that monsters live in their room? Anxiously hanging on to a blanket or comfort toy that is well past its used by date? Unwilling to stay in their own bed all night? Kids First’s Child Psychologist Robyn Fallshaw has been trialling a new resource to help young children to overcome their worries and develop positive behaviours. 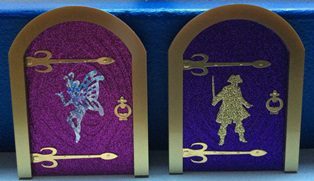 “Fairy doors” and “pirate doors” are new products that are a cheap and easy way to encourage children to change habits or try new things. The glittery ‘doors’ attach to the skirting board in your child’s bedroom, giving the fairy or pirate the opportunity to ‘visit’ your child while they are sleeping. Several studies that link children’s problem solving to imaginary play have been conducted in recent years and Robyn says that psychologists often encourage children to use their imaginations to problem solve. She says that many children are familiar with the concepts of Santa, the Easter Bunny and the Tooth Fairy and that the magical ‘doors’ are an extension of these ideas. She says that so far, fairy and pirate doors have been used for all kinds of purposes, including helping children to give up dummies, blankies and to sleep through the night in their own bed. Robyn says that the fairy doors offer an easy and practical way to get children and parents talking about the things that children worry about. If you are not local to the northern beaches, postage and handling within Australia costs an additional $5.